You can really create some great sounds with this little guy. 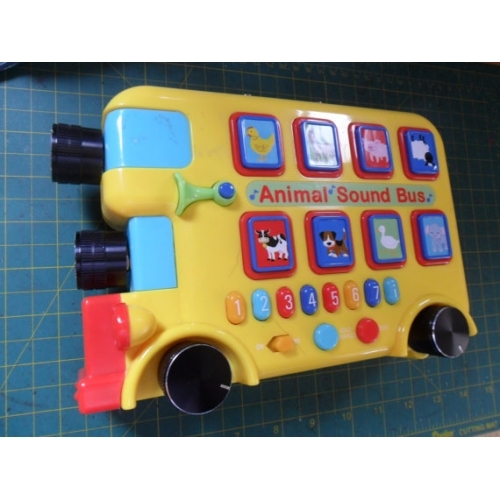 You can not only choose different animals sounds but play a few cool synth sounds too! 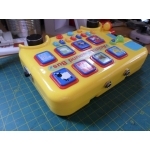 It also has a 555 timer circuit that allows you to control certain aspects of the sounds. The two outputs are both mono... the one on the left is the output from the toy and the one on the right is the 555 timer circuit (atari punk console). When you combine them through a dual 1/4" to stereo 1/4" you can create some really crazy unique sounds.